The Walking Dead: Episode 1 is a very solid introduction for what could end up being a great licensed game series. Developer Telltale Games has carved a niche for itself as one of the premiere North American developers devoted to the old-school genre of classic point-and-click adventure gaming. They are responsible for episodic games featuring Strong Bad, Wallace & Gromit and the Back to the Future licenses, as well as reviving Sam & Max and Monkey Island from the old days of LucasArts. From the start, the company has stuck to the traditional conventions of solving puzzles, interacting with characters and environments, and collecting items to progress the plot. They’ve done all of this with monthly releases of shorter, episodic games, that combine to tell a larger story. 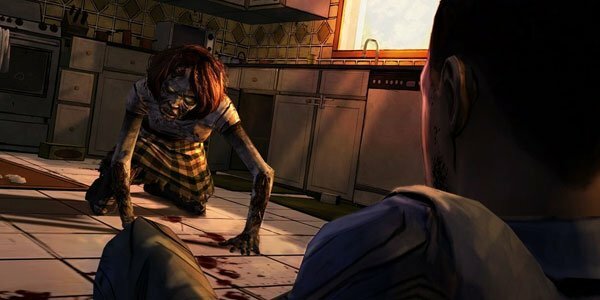 Now, the company is tackling a game set in the world of the popular graphic novel and TV property, The Walking Dead, and they’re breaking from their traditional mold in numerous ways. Thankfully, those decisions pay off here. Lee Everett is a man with a shady past who is in the middle of being driven to prison, when a strange-looking individual in the middle of the road the officer behind the wheel to swerve and crash. Lee escapes, and soon discovers that an apparent epidemic is sweeping the country. It has caused an outbreak of zombies craving human flesh, and they’re passing on their undead state to whomever they bite or kill. The first house Lee enters for help is empty, save for a little girl named Clementine. With her parents out of the state, Lee takes it upon himself to protect them both, and soon meets up with more survivors. From there, it’s a struggle to stay alive, and to keep cool heads between certain members of the group. 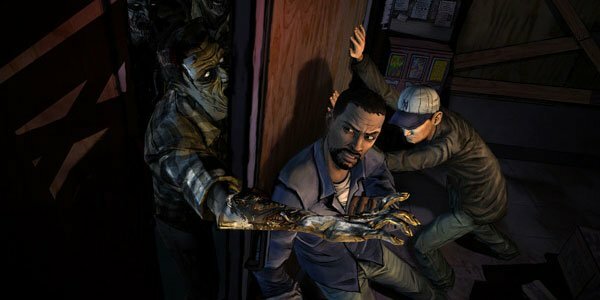 The Walking Dead has much more in common mechanically with games like 2010’s Heavy Rain than a traditional adventure game. Puzzles are still there, but are streamlined in complexity and happen to be less frequent. There is a heavy emphasis on conversing with fellow survivors, but an important factor is in use here. While other games of this kind generally use conversation in a straightforward question-and-answer kind of way, you are often given multiple choices for Lee’s responses. Some of the more important ones even have a time limit, which forces you to go with your gut for a quick answer. Finally, what you say and do to each character will affect their behavior towards you, both in this and future episodes in this five-part series, as saves from previous episodes can apparently be transferred to the next. One great example of how this works comes early on, when Lee and Clementine take refuge at a farm. The patron of the house asks Lee about where he came from, and you can choose to divulge details about being in a police car or try to make something else up. I chose the latter, but afterward, the farmer told me he was able to see through this lie, and the relationship between him and Lee remained strained throughout the episode. Also, some major choices will even affect which characters live and die, which will doubtlessly have an effect on the player’s story path for future episodes. This is a very interesting system that hasn’t been seen in too many games yet, and one that would be a welcome addition to future adventure games, both to give each player their own personal experience and to encourage multiple playthroughs to see different outcomes. There is also an element of basic combat between Lee and certain zombies, but it hardly plays out in a conventional way. When you are attacked, you will see an icon over the zombie as it attacks you, while the camera remains in a third-person dynamic style of shot. Moving a cursor with the mouse or analog stick on top of the icon and pressing a button will cause Lee to attack. Take too long, and you will be eaten, forcing you to reload a previous save. The context-sensitive attack animations are brutal and effective; an early example of bashing a zombie’s skull in with a hammer is particularly gory and detailed. The game’s presentation is generally solid, with an interesting graphical style that finds a good compromise between realism and comic book-styled characters. Its voice acting is good all around, with no weak performances among the diverse cast. The only major problem here comes from how the game runs sometimes, as the game briefly pauses between certain player actions, sometimes up to several seconds. When the game paused to transition between me attacking a zombie to the next cutscene shot for about six seconds, I almost thought my game had locked up, and still felt a bit thrown off pacing-wise when everything resumed. It’s a shame that Telltale couldn’t iron out some of the technical issues, but hopefully they will be less of a problem in future episodes. The Walking Dead is a very solid introduction for what could be a great game series as a whole. 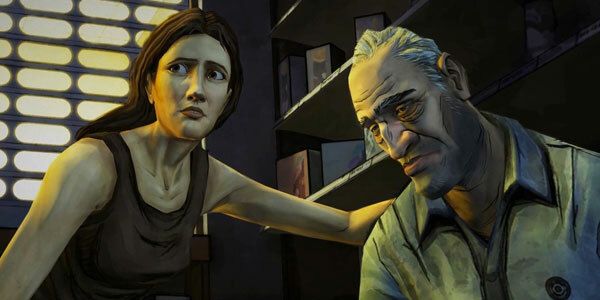 The different gameplay approach Telltale took really enhances the feelings of emotion, urgency, and consequence when they each come up, and you will likely find yourself excited for the next episode when things end after about two-and-a-half hours. The short length may turn off potential buyers. However, considering that this episode has a five-dollar sales price on consoles, and a lot to offer while it lasts, it’s an intense ride that players should definitely take.